Nathan Shoup is a senior communications major at Pacific Lutheran University who graduates in May. He became sports editor at PLU's newspaper the past summer after covering sports for the newspaper and writing for the university's athletic website his junior year. Shoup is a recipient of PLU’s President’s Scholarship, maintaining a 3.4 cumulative GPA. He is also a pitcher on the Lutes baseball team that has a 73-46 record in his three years with the program. He is the lone resident of Woodland, in southwest Washington, in the past decade to play baseball at a four-year university. It appeared the Huskies were upon one of the largest late-season collapses in program history. After finishing the regular season on a four-game losing skid, the Huskies overcame a 22-point, first-half deficit -- biggest in program history -- against the 12th-seeded Oregon (4-27) to prevail 69-62 Thursday night to advance to the quarterfinals in the women’s Pac-12 Tournament. Before No. 5 Washington met No. 12 Oregon in the first-day finale, the first three games of the women’s Pac-12 Tournament at KeyArena Thursday night contained no surprises. Seventh-seeded USC handled 10th-seeded Oregon State, 64-57. Sixth-seeded Utah breezed past 11th-seeded Arizona, 66-48. Even the No. 8 Cougars beat the ninth-seeded Sun Devils, 48-41. Attendance for the inaugural event in Seattle: Small. 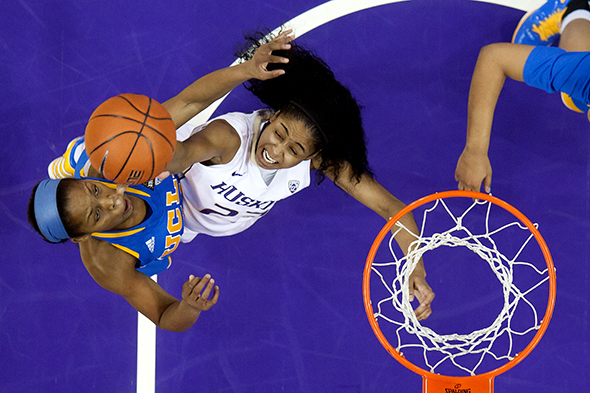 The University of Washington dropped its regular-season finale at home to sixth-ranked California 78-50 Saturday. But it was not the Huskies final game in Seattle this season. For the first time since the women’s Pac-12 Tournament debuted in 2002, the tournament will be held in Seattle at KeyArena. The fourth-ranked Stanford women cruised to a 71-36 win over the University of Washington Thursday night at Hec Ed. But the Huskies lost the Pac-12 Conference hoops matchup Tuesday, when coach Kevin McGuff announced the one-game suspensions of two of his top players, Jazmine Davis (19.2 ppg), Talia Walton (13.9) and reserve Deborah Meeks.